A 1.5-carat diamond is a good value choice if you're looking for a slightly larger stone. It looks almost as large as a 2-carat diamond, but at only half the price. It's big enough to be eye-catching, but still not so big that you get crazy attention. Many girls think it's the perfect size. Before you go out shopping for a 1.5-carat diamond, read this article. Learn how to get the best 1.5-carat diamond for your budget. A 1.5-carat diamond can cost anywhere between $5,000 and $35,000. The cost depends on the quality of the stone and how well cut it is. In general, we recommend the best value to be somewhere between $8,000 and $12,000. This is where you can find a good balance of quality, beauty, and price. How Much Does a 1.5-Carat Diamond Cost? A 1.5-carat diamond is about twice the price of a 1-carat diamond. A 1.5-carat stone can cost anywhere between $5,000 and $40,000. The price depends on the quality of the stone. Flawless and colorless 1.5-carat diamonds will cost many times more than diamonds with visible flaws and a yellow tint. The colorless, flawless diamond on the right costs close over $20,000. But you don't need to spend anywhere near that to get a beautiful 1.5-carat diamond. The diamond on the left represents a good balance. We recommend ideal cut, VS2 clarity, and color H for a sparkling, eye-clean, white-looking diamond. Did You Know? Only about 1 out of every 7 million diamonds are completely flawless and colorless. Most diamonds used for jewelry are in the "near colorless" and "slightly to very slightly included" ranges. This is completely fine because you cannot see slight tints of color or flaws with the naked eye. 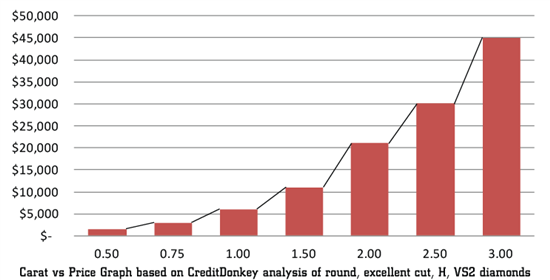 For a more detailed pricing list, we put together the following chart. 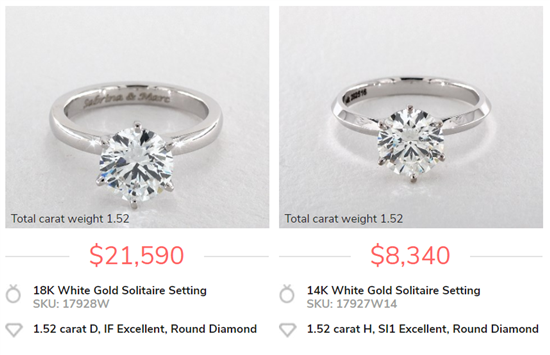 This chart shows the price ranges of a 1.5-carat, ideal cut, round diamond. Considering a fancy cut diamond? They can cost as much as 40% less than a round diamond. Oval, asscher, and marquise cuts are pricier, but they are still as much as 15% less than a round diamond. Emerald and cushion cuts tend to be the least inexpensive. This may help you afford a 1.5-carat diamond on a smaller budget. How Big is a 1.5-Carat Diamond? A 1.5-carat diamond will definitely stand out. The size will look good on any hand. On smaller hands, it will look even larger. The diameter of a round 1.5-carat diamond is 7.4 mm. This is significantly larger than a 1-carat diamond (diameter 6.4 mm). And only 0.6 mm less than a 2-carat diamond (diameter 8 mm). The face-up surface area is 43mm2, which is just 18% smaller than a 2-carat diamond. This makes the 1.5-carat diamond very good value. It looks a lot larger than a 1-carat diamond, and only a little bit smaller than a 2-carat diamond, but just half the price. Tip: A 1.5-carat diamond will look nice in a variety of settings. To keep the attention on the diamond, it'll look lovely as a solitaire. Of if she likes something flashier, it'll also look nice with a halo or diamond accents. See the different types of settings. Go for a color of H and clarity of VS2 for an eye-clean diamond that appears white. If your budget is smaller, you can consider going down to SI1 clarity and color I. These shapes have elongated ends, which trap more color. We recommend you don't go below H in color. These step-cuts have a large window straight into the depth of the diamond. Any flaws or color are more easily seen. We recommend you go with clarity of VS1 and color H.
You can afford to go for a warmer-toned diamond to complement the band. You can go down to a K in color. If you don't mind a warmer look or plan to set the diamond in a yellow gold band, then a J or K could look beautiful. Below is a H diamond set in white gold and a K diamond set in yellow gold. You can see that the warmer-toned diamond looks great in a yellow gold band (and costs a lot less). You don't need a flawless stone. All you need is to make sure that it's eye-clean. 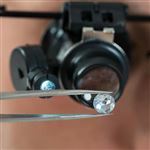 We recommend VS2 clarity for an eye-clean diamond at a good price. If you are able to see actual photos/videos of the diamond, you can go down to SI1 to save more money. For emerald and asscher cut diamonds, we recommend upgrading the clarity to VS1. These step-cut diamonds have a large open table that reveals all flaws. Cut Is The Most Important. Always put whatever money you have into the best cut possible. Cut is what makes a diamond brilliant and beautiful. We recommend no less than an Excellent/Ideal cut. Make sure the diamond is GIA or AGS certified. Both laboratories have high consistent standards. While GIA- and AGS-certified diamonds are more expensive, this is an area you should not compromise on. 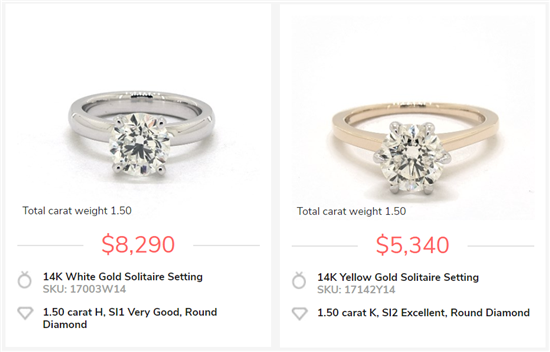 To truly get the best deal on a 1.5-carat diamond, we recommend that you shop online. Online stores have a much bigger selection and better prices. You'll have so many more options to choose from, so you can pick one with the specs you want. For example, currently on James Allen, there are over 500 ideal cut 1.5-carat round diamonds with color H+ and clarity VS2+. Your local jewelry stores won't have so many options. Our favorite online store is James Allen. They have a sizeable selection of 1.5-carat diamonds at all price ranges, specs, and shapes. The best part is their 360-degree HD videos for every diamond in their collection. You can spin them around to pick the one that appears eye-clean. Lab created diamonds are identical to the ones mined from the Earth—it's just that the diamond creation process is sped up in a controlled lab environment. 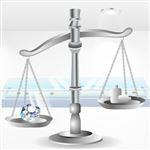 Besides being more eco-friendly, lab diamonds can be up to 35% cheaper. Check out lab created diamonds on Brilliant Earth. You can find super ideal H, VS2 1.5-carat lab diamonds for as low as $5,000. The halo setting is best for making a splash with less money. It has a ring of small diamonds around the center stone, so from far away, it looks like one big diamond. With a halo, a 0.70-carat diamond can look as large as a 1.5-carat diamond. Compared to the $8,000+ cost of a 1.5-carat diamond, a 0.7-carat diamond costs around $2,500. The thinner the band, the larger the center stone looks. A thin pavé band will make the center stone pop even more. A smaller stone will still stand out and look great. Fancy-cut diamonds often appear larger than they are. So you can go for a slightly smaller stone. And they're cheaper too. Plus, they are more unique and will appeal to the girl who likes to stand out in a crowd. 1.5-carat diamonds are great value for the size, since they look almost as large as a 2-carat diamond. We hope this guide gave you some good tips on shopping for a 1.5-carat diamond. Before you start shopping, make sure you understand how diamonds are priced. This way, you don't overpay for features that you cannot even see. Our beginner's guide to best value explains more about what to look for and what you can "go cheap" on. Leave a comment about 1.5 Carat Diamond?